And I love my job, because it allows me to travel! In the past 4 years, I have traveled 5 times to the USA. There's a lot of things I like to do there, which is naturally evident from my various US travel and food posts. But there's one more thing I so look forward to. And that is wearing a saree in USA. You never, I mean, literally never, fail to grab eyeballs and get compliments from total strangers. Plus they make up for such good pictures which I can post on my blog. 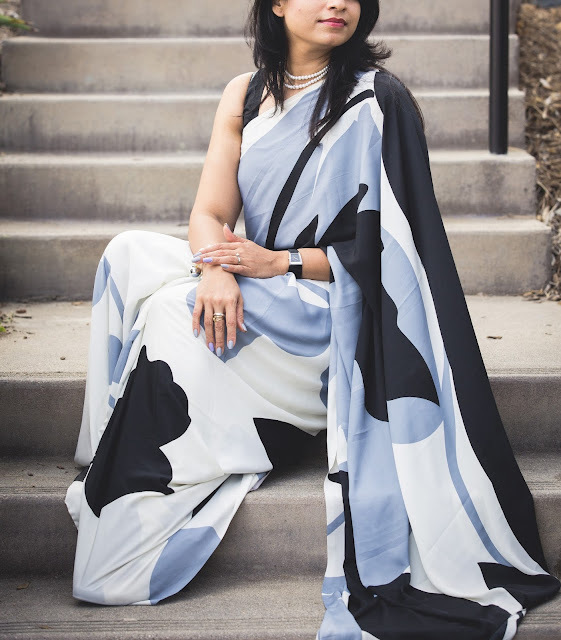 So, without much adieu, let's scroll down to see my various saree features on the American Land. 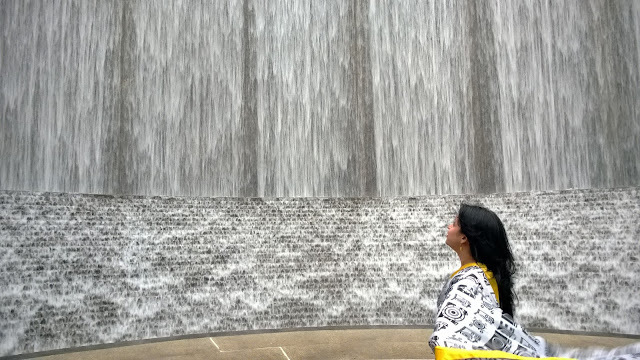 The first time I wore a saree in the US, was in Houston, Texas. 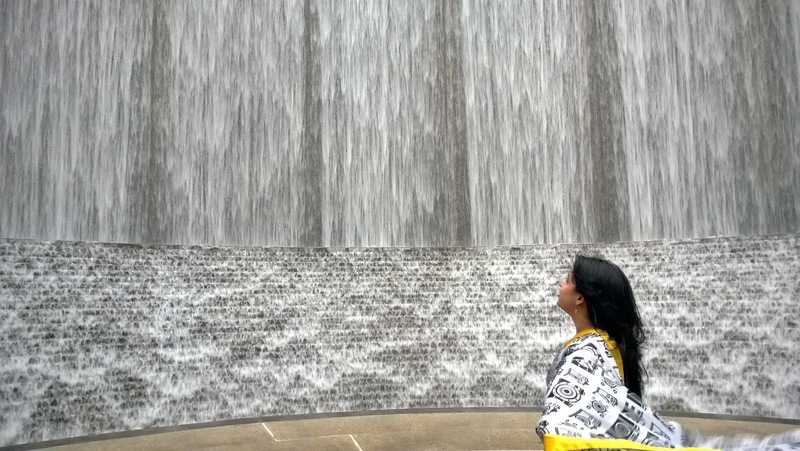 A quick lunch at a friends place and then visit to the Water Wall Place, the one that featured in this Sanjay Kapoor and Sushmita Sen starrer Bollywood song. 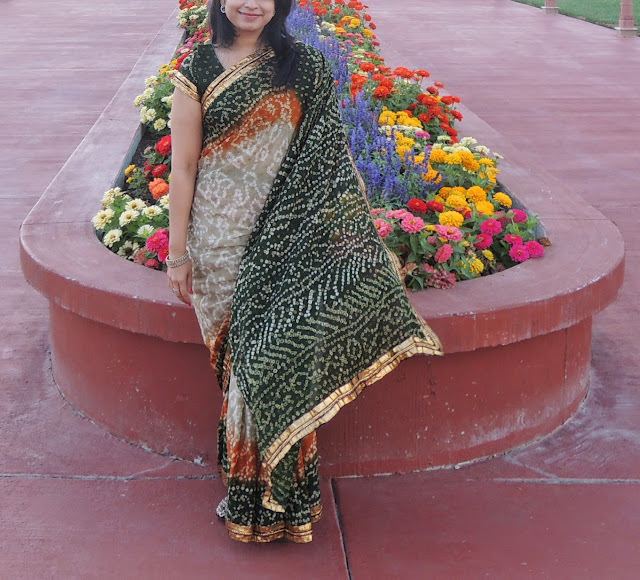 The second time, I wore a saree in the USA was in Chino Hills, California. I was visiting the BAPS Swami Narayan Temple, and thought it was the perfect place to flaunt my bandhani saree. I also ate a taco at Taco Bell after the temple visit in my gorgeous saree, with plenty of customers staring at me. On my next trip, I wore a Khadi silk saree for dinner at a friends place. 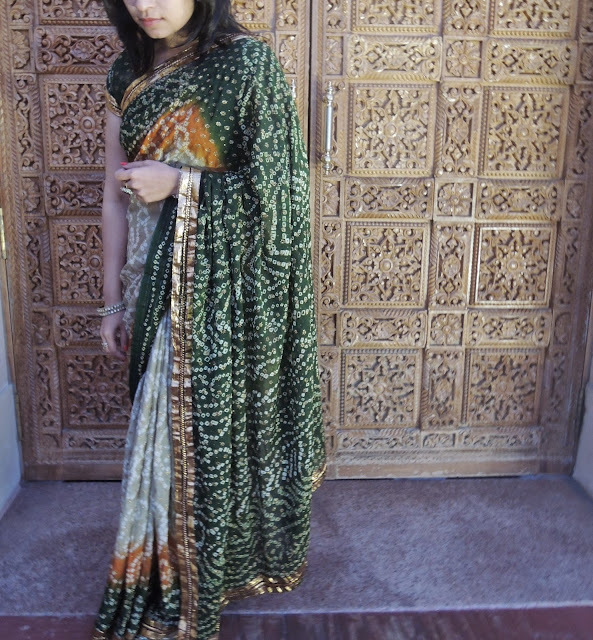 Unfortunately we don't go sightseeing in this saree, but the saree look was appreciated by the hosts and our friends. This gorgeous saree that I bought from Limeroad, reached exactly a day before I was heading to yet another US trip. I didn't have time to stitch a blouse, so I simply pulled an old black blouse to teamit up with. I wore it for a lazy outing to Laguna Beach in California. I have already said that saree on a beach is definitely my thing. 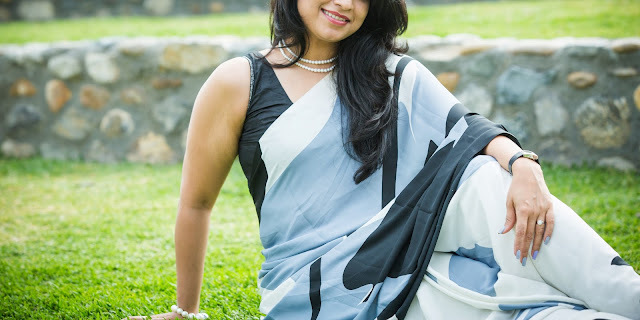 But when I wore this saree at Laguna Beach, I was stopped over by more than dozen of visitors to compliment me about my saree and the way I was carrying it. Now, that I have exhausted my self appreciation limit for the day(or may be a month), tell me; have you worn a saree in a foreign land? How was your experience? wow nice all saree collection thanks for sharing his post. latest blouse designs.